Recently I am seeing more and more pieces with this colorblock theme. Therefore I will conclude colorblock will be the trend for coming spring and summer. Although I can't say I adore everything I see in this new trend, I will say certain color combinations are simple refreshing and quite snazzy in my humble opinion. Herve Leger $1150 - I have tried my share of bandage dresses in various price points and nothing is close to the type of fit and resulting silhouette that Herve Leger can provide. Juicy Couture Colorblock Snap Accent Dress $228 - I love this dress for the color combo and it looks like an outfit instead of a dress. I noticed recently St. John pieces had become younger and trendier. St John is no longer something moms wear anymore. Colorblock Voile Top $395. 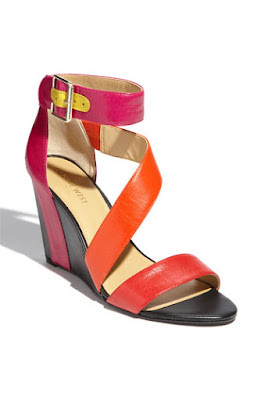 Last but not least, I love this pair of Nine West wedge for the style, colorblocking combo and the price $88.95. What about you, do you like colorblock and what would be your favorite combo? I do like colorblocking. I'm surprised it's still in, since it seemed to be popular last year. That blue and black dress looks amazing--I'm going with that! I love all the colorblock combos. Anything with magenta and lime green is my fave. Love this trend, especially the amazing shoes! I love how colour blocking has had so much staying power. It works on so many levels - glad to see this trend continue. Agreed! Color blocking seems quite a strong trend to last this long. I think, at least for my city, it could be b/c it's a trend that does require some reckless bravery so not everyone is willing to try it and therefore we don't get trend overexposure. You should totally get one of these items! They are fun, yet not overdoing it. i love that nine west sandal!